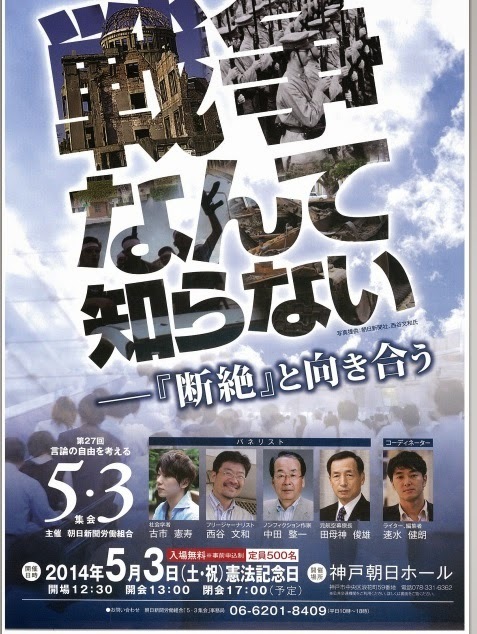 Tomorrow, on Constitution Day, at a conference organized by The Asahi Shimbun's employees union on war and the Constitution, General Tamogami Toshio will be one of the featured speakers. will be one of the featured speakers. You don't believe me? Look at the image above. Click on it if you want to see it in a larger size. I called the number on the poster. It is the number of the employees's union. The event will take place tomorrow. This is so wrong in so many ways one can only think that Hell hath truly frozen over. Will you go? Would be a great blog post. I read your blog to better understand Japanese politics and culture. Apologies, but your efforts to be clever too often obscure the point you're trying to make. In this case, you simply fail to explain why "This is so wrong in so many ways." Your efforts to educate readers of your blog are much appreciated. 1.) Featured speaker includes Gen. Tamogami (ret. ), most (in)famous for justifying Japanese aggression in WW2 and advocating for nuclear armament. He was sacked for writing an essay that, among other things, claimed China benefited from Japanese occupation. 2.) Perhaps more ironic given the event is taking place celebrating the constitution, Gen. Tamogami was dismissive the Nagoya High Court's decision that the SDF's mission in Iraq was unconstitutional. 3.) A left-of-center paper is hosting this shindig. I'm sure there are other issues I've missed. In the organizer's defense, there's a reference to "Thinking about the Freedom of Speech" so maybe it's one of those "I will die to defend your right to be wrong" kind of party. That Tamogami is given any airtime at all is comedy in itself, but that Asahi Shinbun, a newspaper almost universally hated by the right, would ask Tamogami to be a panelist on the subject of war borders on the surreal. My hope is that his role will be to get torn apart publicly. Thank you both for filling in holes in my admittedly limited knowledge of Japanese politics. Much appreciated. I also wonder at this freezing over of the left. However the previous emperor said that there would be a long winter before his followers re-emerged (that is the gist of what he said) so think on the other hand that a re-emergence of the right is taking place. I wonder how the Buddhists groups feel about this Shinto re-awakening. I also wonder how it relates to the maturing of the Prince Hisahito.